HP Chromebook 11 G5 is a portable laptop to check out if you are in the market for a budget offering. The Chrome-powered notebook is especially best suited for students with offers of reliable performance, long battery life and optional IPS touchscreen. If you are after a small laptop you can easily tuck in your bag and hit the road, this is a candidate. The HP Chromebook 11 G5 weighs less than 1.2 kg and is only 18.4mm thick. At this rate, it is both lighter and thinner than the earlier version. HP Chromebook 11 G5 offers a full-size, island-style keyboard. The anti-glare display measures 11.6 inches diagonally and has a standard resolution of 1,366 x 768 pixels. The screen quality makes it easy to use outdoors. You can also get the laptop with a touch display protected by Corning Gorilla Glass. You should expect the sort of performance offerings that Chromebooks normally deliver. The HP Chromebook 11 G5 should handle most everyday tasks easily, but do not expect anything out of this world. HP ChromeBook 11 G5 is powered by an Intel Celeron processor, codenamed Brasswell, with integrated Intel HD Graphics 400. The CPU receives support from up to 4 GB of DDR3 RAM. You get up to 32 GB of eMMC storage – measly but not surprising for a Chromebook, which is cloud-centric. HP promises battery runtime of up to 12 and half hours, although this will differ among configurations. As the name indicates, the HP Chromebook 11 G5 boots Google’s lightweight Chrome OS. The minimal internal storage means you are likely going to find the two-year complimentary cloud storage very valuable. The multi-format card reader onboard will also be useful for storage expansion. Connectivity options include dual band Wi-Fi 802.11ac, Bluetooth 4.2, two USB ports and an HDMI port. The HP Chromebook 11 G5 laptop runs apps from the Chrome Web Store and/or the Google Play Store. It is built for collaborative learning with an HD camera, a Google Hangouts feature, and noise suppression for improved HD audio. 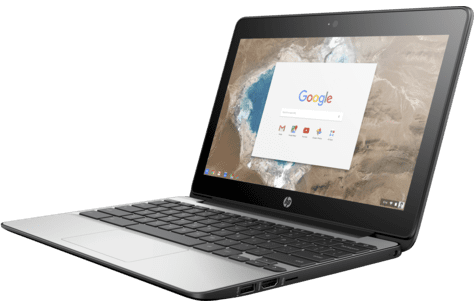 HP Chromebook 11 G5 laptops are not yet available Nigeria, Kenya, and Ghana and are not popular in the African continent. Hence, we do not expect it to launch officially in Nigeria, Ghana, or Kenya. If in the rare event you find it, we expect HP Chromebook 11 G5 price in Nigeria range from 70,000 Naira to 190,000 Naira, depending on your location and the configuration of the laptop.